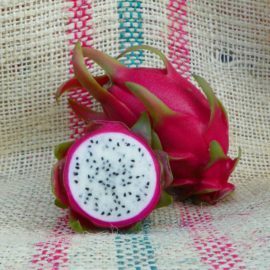 Spicy Exotics Dragon Fruit, Pitaya, or Pitahaya plant cuttings for sale. "purple flowering variety with an amazing sweet fruit"
"rare variety that has the best tasting fruit"
"hard to find variety, but offered here at Spicy Exotics"
"beautiful fruit both inside and out"
" has a nice refreshing lemon flavor! " "heavy producer all year long"
"easy to grow variety, perfect for beginners"
"the sweetest of all Dragon Fruit"
Spicy Exotics is the best place to go to get your dragon fruit cuttings. 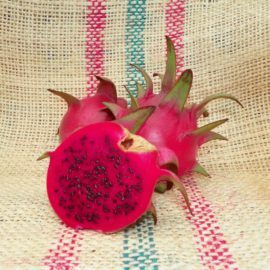 There’s an extremely large variety of dragon fruit selections to choose from, and the quality of the cuttings shipped are excellent. Overall cost makes my purchases some of the best deals I’ve ever made. In two years, I’ll be enjoying the fruits of my labor for many years to come. Additionally, thanks to Tye and his efforts to collect all the various dragon fruit varieties he has, we consumers benefit from it. And through our purchases, hopefully, Tye can track down those elusive rare dragon fruit varieties for our enjoyment. After growing many types of plants over 30 years, we found our one love, Dragon Fruit. In 2006 we started with our first three varieties of Dragon fruit plants. Since we have collected and grown over 100 varieties from all over the world. We are proud to say, Spicy Exotics is your source for over 100 varieties of Dragon Fruit plant cuttings for sale. Dragon Fruit, Pitaya, or Pitahaya originated in Central America and now can be found in most tropical areas. In the USA these areas include Hawaii, California, and Florida. It’s a subtropical vining cactus. So it loves lots of rain yet can tolerate dry weather. Most varieties are fast growing making easily adaptable to new environments. As mentioned above, the plant is a vining cactus with fleshy three sided growth and spins along the edge of this growth. The plant creates huge night blooming flowers that are beautiful and fragrant. If the flower is pollinated it will create one of the most amazing fruits. Varieties can be either red, pink, green or yellow skin with white, pink, purple, or red flesh. The fruit sizes can vary ranging from 0.5 pounds to a whopping 3.0 pounds in size. The fruit is easy to peel with a kiwi type texture and eatable seeds. Dragon Fruits has taste ranges from mild to sweet to complex. 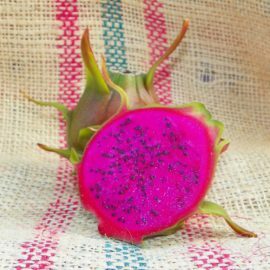 Dragon Fruit is superb eaten chilled, but can also be enjoyed when juiced, cubed in salads, or even as jams. 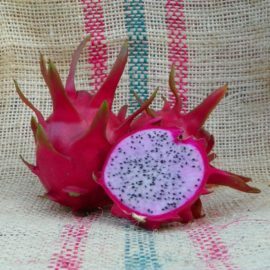 For great uses of Dragon Fruit check out our Pinterest page.